(U//LES) Warrants in Jasper County, Missouri, Cass County, Missouri, Clay County, Missouri and Grand Saline, Texas have been issued for Donald Anthony Moses, aka Tony Moses, for financial exploitation of the elderly and felony theft targeting senior citizens by committing home-repair schemes. 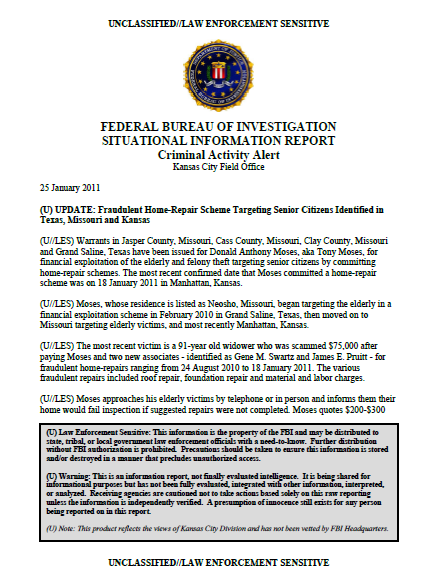 The most recent confirmed date that Moses committed a home-repair scheme was on 18 January 2011 in Manhattan, Kansas. (U//LES) Moses, whose residence is listed as Neosho, Missouri, began targeting the elderly in a financial exploitation scheme in February 2010 in Grand Saline, Texas, then moved on to Missouri targeting elderly victims, and most recently Manhattan, Kansas. 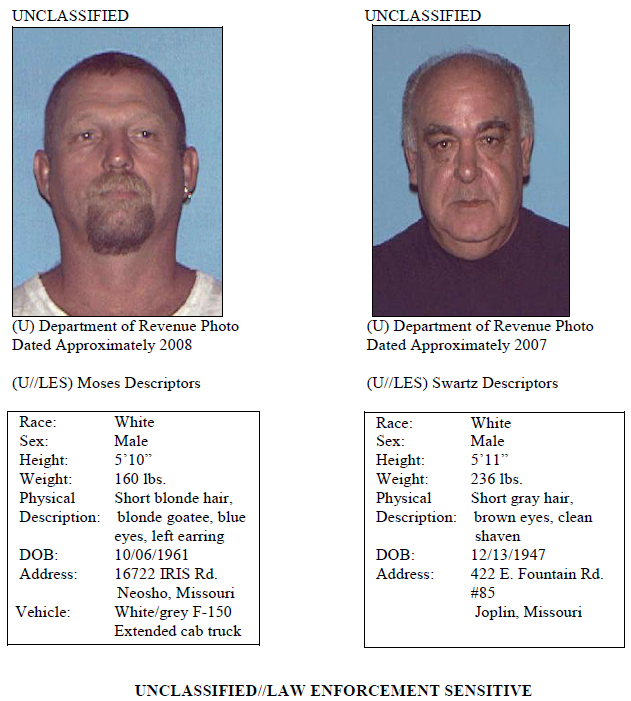 identified as Gene M. Swartz and James E. Pruitt – for fraudulent home-repairs ranging from 24 August 2010 to 18 January 2011. The various fraudulent repairs included roof repair, foundation repair and material and labor charges. (U//LES) Moses approaches his elderly victims by telephone or in person and informs them their home would fail inspection if suggested repairs were not completed. Moses quotes $200-$300 for home-repairs, such as sealing driveways, clear-coating roofs, installing flashing on rooves, cleaning gutters and rebracing attics. However, he bills the victim several thousand dollars to tens of thousands of dollars in repair charges. Moses uses scare-tactics and threatens to contact his attorney if they do not pay the fraudulent repair charges. Furthermore, Moses threatened an elderly victim in Texas by intruding in her home and stating that he was not going to leave until the victim wrote a check to Moses for several thousand dollars. (U) The FBI is releasing this information for situational awareness. Information regarding this investigation should be reported to the FBI Kansas City Division at 816-512-8200 or Springfield Resident Agency at 417-882-3303.